Metro Persoskie was born to Ukaranian immigrant parents, Alexander and Mary Persoskie, in the coal-mining town of Iselin in western Pennsylvania. The town was built at the turn of the 20th Century for the Rochester & Pittsburgh Coal & Iron Company, and the skinny left-handed pitcher was well-known in the local area. Despite the small size of the town, Iselin had two of its sons, Sig Broskie and Red Tramback, playing in the minor leagues during the 1930s, and in August 1939, Persoskie - accompanied by local storekeeper John Rosenberg, who represented himself as the youngster's manager - traveled to Pittsburgh for a trial with the Brooklyn Dodgers. Despite his size (5-foot-9 and 165 pounds) the Dodgers were impressed with Persoskie's work in the bullpen and allowed him to throw batting practice against the Brooklyn hitters. "One after another the Brooklyn hitters came back to the bench," reported the Brooklyn Eagle, "saying things like 'Who the heck is that kid?' . . . 'I hit that last one good but the punk fooled me with a curve just before that' . . . 'Say, I wonder who taught that boy to make a fastball sail' .. . 'I don't know who he is or where he came from, but there's many a guy getting by in this league with less stuff than he's got.'" The Dodgers were keen to sign the youngster but when Rosenberg learned this, he tripled the amount he wanted them to pay. Angered by this, coach Charley Dressen made the 50-mile trip to Iselin to get Metro's mother to sign a deal. Dressen found Metro's mother in a weather-beaten, unpainted shack. She could neither speak nor understand English and Dressen had, first, to find an interpreter. Dressen learned that Metro's father, a miner, had died in 1932 and times were hard for the mother of six, with young Metro unable to secure a job in the coal mines and that the family's only income was the few dollars he was able to make pitching in sandlot games. Dressen gave the mother a few hundred dollars and she signed the contract for ther son to play professional baseball. The deal, however, was not as smooth as it should have been. Rosenberg, the storekeeper, claimed that the Brooklyn club had promised to pay him $250 if Persoskie signed and he filed a suit against them when they failed to pay. In May 1941, Rosenberg was awarded a verdict of $275.25 against the Dodgers. Meanwhile, Persoskie returned to Brooklyn with the Dodger's and finished the year playing semi-pro baseball for Joe Fero's Glendale Farmers. In 1940, he was initially assigned to the Dayton Wings of the Class C Middle-Atlantic League, but was optioned to the Superior Blues of the Class D Northern League before the season began. Persoskie had an 8-6 won-loss record and a 3.63 earned run average in 20 games on the mound for the Blues, and also played the outfield in 19 games for a .210 batting average. In 1941, Persoskie joined the Valdosta Trojans of the Class D Georgia-Florida League. In 25 outings he had a 9-7 record and 3.82 ERA, and moved on to the Lancaster Red Roses of the Class B Interstate League in 1942. Persoskie made five appearances for the Red Roses before military service called in July. He trained with the Army Air Force as a radio operator/aerial gunner with the 806th Technical School Squadron at Sioux Falls Army Airfield, South Dakota, and in October 1943, he was assigned to the 546th Bomb Squadron of the 384th Bomb Group, Eighth Air Force, at Grafton-Underwood in England. Staff Sergeant Persoskie was a waist gunner on a Boeing B-17 Flying Fortress and successfully completed 14 daytime missions against targets over enemy-occupied Europe. On February 22, 1944, the 384th Bomb Group's target was the Junkers Aircraft Fuselage Plant at Aschersleben, Germany. 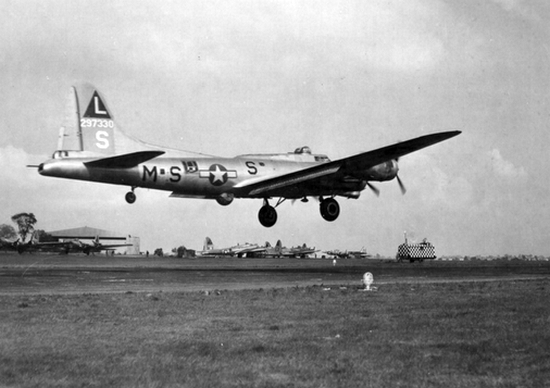 As B-17s from various bomb groups assembled over England, Persoskie's B-17G (#42-31516), piloted by Second Lieutenant Sydney R. Jeter, Jr., collided with another from the 303rd Bomb Group. The other B-17 was cut in two at the rear door position and both planes plunged to earth. Only the navigator and bombardier of Persoskie's crew managed to escape, while a waist gunner of the other bomber also parachuted to safety. Seventeen airmen, including Staff Sergeant Persoskie, were trapped inside the stricken planes and perished on impact in the British countryside at Irthlingborough in Northamptonshire. 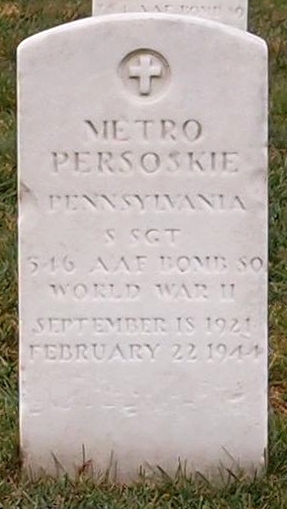 Metro Persoskie was buried at Arlington National Cemetery in Fort Myer, Virginia. Thanks to Bob Fulton for his invaluable help with this biography. Thanks also to Astrid van Erp for help with photos and information for this biography.